Enroll Here! Just Do It! Join Our Dog Grooming School Today! Plan "A" + Plan "B"
*Plus a FREE PediPaw! fREE Shipping! fREE Streaming! & More! Recieve "My Dog Grooming Guide" 500 page e-Book for FREE! Please fill out the following for your FREE "TestDrive" and e-Book! Become a "Certified Pet Hygienist" & "Certified Pet Groomer"
1. All Videos to watch on our streaming servers day or night, 24/7. 20 Videos & hours upon hours of instructions! 2. Watch any new uploaded video on our streaming server for free, no additional cost! Latest was the "Bedlington Terrier"
3. Read "My Dog Grooming Guide" online! 6. A "Pet Hygienist Certificate"
7. A "Certified Pet Groomer Certificate"
PLUS All of This "Plan B"
"My Dog Grooming Guide" a $79.95 Value! 20 Grooming DVDs Mailed to You, USPS, to Watch on Your Television, a $424 Value! International Residents Please Use Form Below! PayPal Use "Buy Now Button"
Over 62% Off Only $175 "Plan B" + "Plan A"
Fill Out Form Below! Act Now! Please Check Box! Plan A & Plan B. Out of the country there will be an additional $49.95 - 79.95 for postage depending on location. One Payment of 175 "Plan A & B"
Card CVC Back of Card! 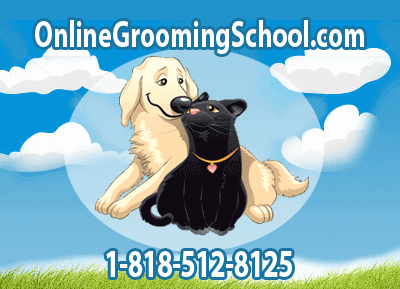 Tags: Online grooming school, pet grooming school, dog grooming school, pet grooming training, pet grooming certificate, home study grooming school, pet grooming class, dog grooming class, dog grooming training, dog grooming certificate. * Could be renewed without notice to midnight of the subsequent day!